Happy Bankholiday Monday to you all. If you are blogging and crafting I can only assume the weather where you are is not that good. Anyway - I got a text last Thursday morning from a second cousin (well I think that's what you call your cousin's child????) to tell us that his partner had just given birth to a new baby boy. We knew he was on his way and that he would be called George but I hadn't thought about a card for him. I had seen a great sketch at CCEE stampers that gave me the impression of quilting so I used it to make this card. I used papers from my box of bits and printed the fab horse which was a freebie from Becky's Place and coloured it in with Promarkers. I used a nesties die to cut it out and edged it with tumbled glass and faded jeans before hitting the whole thing with the sewing machine. Boy was I pleased with the result. The sentiment I made in Word and printed onto some of the patterned paper. Even if I say it myself - it's not bad eh? Hint - check back on Thursday for more sewing and be prepared for the next MAWTT challenge. Hope you bankholiday weekend has been going well. I had hoped for at least and end of summer feel to the weather , instead it's been more like mid autumn. Can it improve to an Indian Summer we ask????? Hope so. Fab quilted card, Brenda...love the horse and your stitching! A FAB card and George's parents will love it. Weather here is nice so I really should be getting up soon!!! It's Bank Holiday and I'm having a lazy day! Havent been around much during the School Hols. I have had to look after two Grandchildren whilst their mums are at work, then I have had to deal with delivering loads of parcels during the Summer sales. I am hoping that after next week my mojo will be back in action and I can get some crafting done.We have also had problems with our broadband provider, the speed was very slow and so from the 20th August we are with another provider where the speed is much much quicker and less frustrating. Anyway I diverse from the important point. I see you are still producing some wonderful works of art, they really blow me away. I am absolutely loving this baby card. The card says it all, the quilting effect, the little horse and most of all the awesome stitching. George' parents will be delighted to receive such a beautiful piece of work. What a gorgeous new baby card, love the image and all your perfect stitching. Thank you for joining us at C.R.A.F.T. this week with your lovely creation. That's gorgeous, Brenda. I love the image, and the patchwork effect in the background is stunning. what a beautiful card and lovely details, thanks for joining our firsr CES challenge. Gorgeous card! Your stitching looks lovely! Thanks so much for joining us for the 1st CES Challenge! What an adorable card! Thanks for playing along with Makeup 4 the Weekend! This is just precious!! Thank you so much for playing along in this week's Makeup 4 the Weekend challenge!! Now that is GREAT take on a Birthday Card! LOL! Love it and the stitching is fab! Thanks for playing this week's makeup 4 the Weekend Challenge! Crazy cute! I love the softness of the colors and the cute image. Thanks for joining us for the Makeup 4 the Weekend challenge. Oh wow Brenda this is just the tops, what a great quilt effect and love that image. OMG!!! 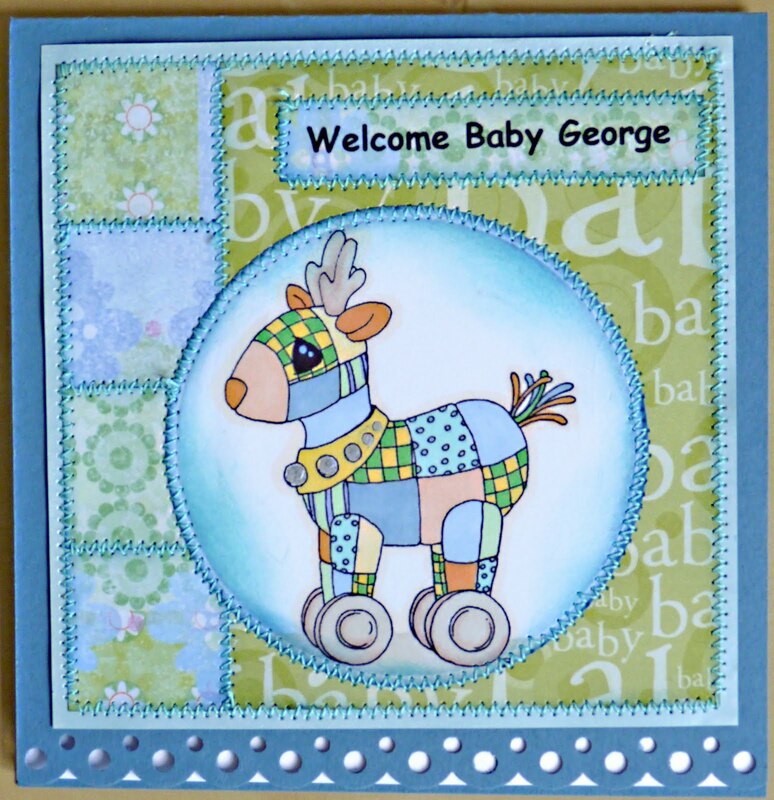 Adorable and sweet baby card! Your stitching is incredible! Thanks for joining us at Paper Makeup Stamps this week! Absolutely adorable, I love the stitching. Such a cute image, too. Thanks for joining us in the CCEE challenge. Lovely card. Thanks for playing at M4TW this week. Totally gorgeous Brenda, such a cutie.Thanks for joining us in the first CES Challenge and hope you can join us again soon! How sweet is this!! Your sewing is fabulous!! Thanks so much for joining our CCEE challenge! What a lovely Birthday project! Great job! Thanks so much for playing along with us in last weeks Birthday Challenge at KWED! We hope you will join us this week in our Travel Challenge!